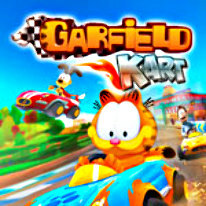 Join Garfield and his friends in this funny, fast and FUR-ious game! What character do you want to play with? Choose any character from Garfield to Odie to Jon, even the most adorable kitten in the world, Nermal...it's totally up to you! Take part in no-holds-barred fast paced, completely crazy races! Race through 16 DIFFERENT CIRCUITS in stunning 3D environments from the world of Garfield (Garfield's neighborhood, the city, the Mally supermarket, the sunny farm, the misty docks, the oasis, the dark manor house, etc.) Use your best driving skills and collect all of the bonus objects to be first across the finish line! But watch out...it's a free-for-all out there! -8 CHARACTERS — Garfield, Odie, Jon, Nermal, Arlene, Liz, Harry and Squeak. -DAILY CHALLENGE: Try out a new challenge every day!